I hope everyone had a fantastic Easter weekend full of family, some wonderful memories, and maybe even a few chocolate treats! We had a busy weekend as my oldest son turned 16, where does the time go? It's hard to believe that 16 years ago he made his appearance just 13 minutes before Easter was over, he was mad that his birthday fell the day before Easter this year with the leap year. 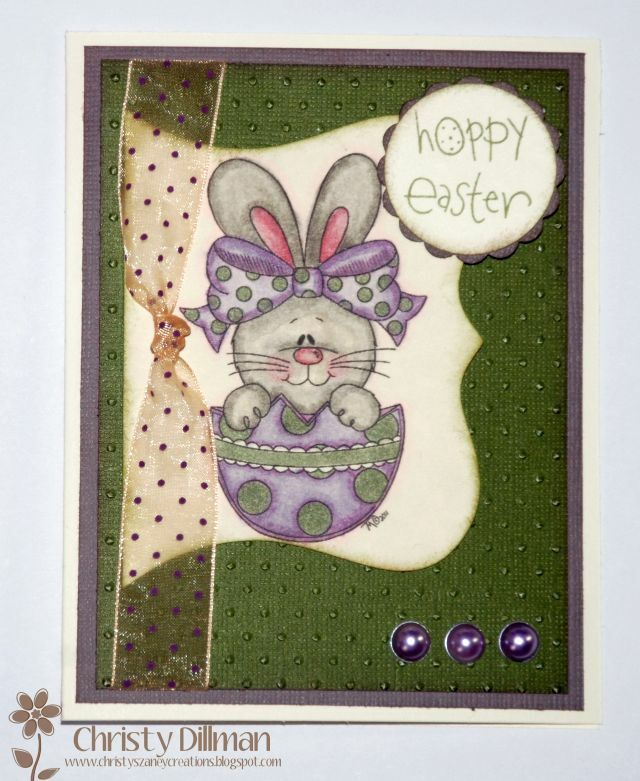 Once again it's Monday so that's mean another challenge at Lollipop Crafts and this week's theme is all about Easter. We want to see all those projects you created for Easter, the skies the limit on this challenge as anything goes! No sponsor this week, but there is lots of yummy eye candy from the design team so stop on by and check out our projects! Batter up! I just loved this image from Kenny K with 2 baseball players in my home, so I knew it was perfect for my project this week at Craft Your Passion. This week is all about shaped cards and so I decided to try my hand at creating my base to look like home plate. Well after many attempts I finally settled for this one, not quite right but close enough. 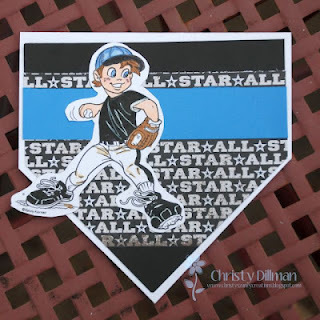 I dug into my scraps for the all-star paper which I picked up at Hobby Lobby when on sale! Of course now became the task of how to color the image, since I have one boy wearing black and gold (Tigers) and one wearing blue/black/white (Dirtbags) how would I ever decide. Well in the end my little guy won out, since he chose to help! I kept this one nice and simple with no sentiment that way I could use as needed for a coaches gift or birthday card for one of players in future! Make sure to check out the blog as our design team has "hit it out of the park" this week with their shaped cards! We are changing things up a little at Lollipop Crafts, our sponsor spotlights will now be on Wednesdays instead of Thursdays. So remember to check us out on Mondays for new challenges and Wednesdays for more about the AMAZING sponsors we have each week!!! Vroooom, vroooom!!!! 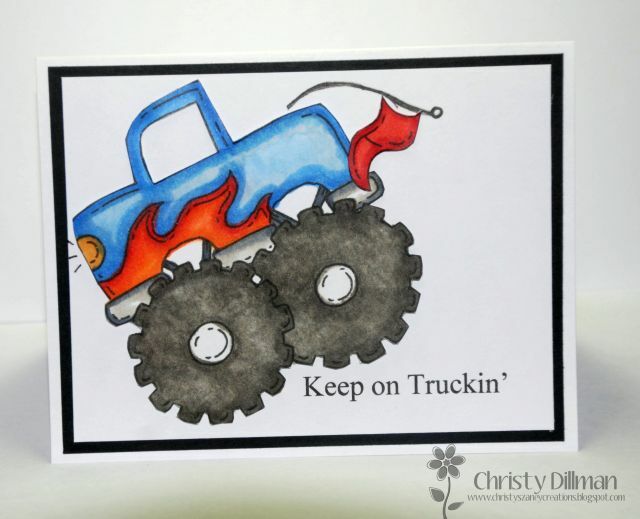 Isn't this image perfect for all those rough and tumble, dirt covered boys in our lives? 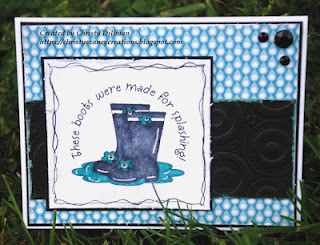 Our challenge # 74 this week is all about keeping things simple- NO embellishments allowed, I know it's hard not to add some ribbon or bling to our projects but sometimes less is more. 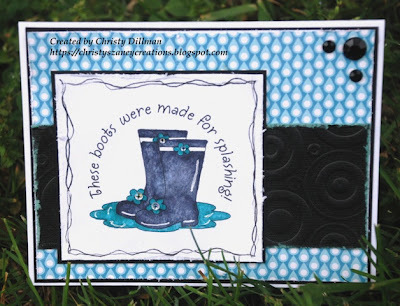 This image is courtesy of one of my favorite sponsors this week at Lollipop Crafts, Meljen's Designs. The image is called "Flaming Monster Truck" which I have colored with my copics and then fussy cut out. Now the way I wanted to put it on my card required me changing things up a little with the flag, so I cut out my flag and then drew the antenna back on. After I computer generated my sentiment, I popped up my truck on my card at an angle making it look like it had just finished jumping it. I am going to give this to my lil' man as he is working hard on his sight words and math at school! Our prize this week is 4 images from their store. 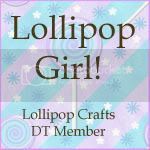 Make sure you check out the Lollipop Crafts blog as we have some new faces as well as some seasoned gals! 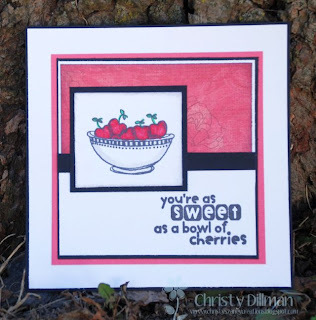 Craft Your Passion Challenges has a great challenge this week, we want to see stripes and/or spots on your projects. We have 3 wonderful sponsors this week, so make sure you join us to win one of the fabulous prize packages. I got to work with images from Scrapper's Delight and the "tears from a clown 3" set. 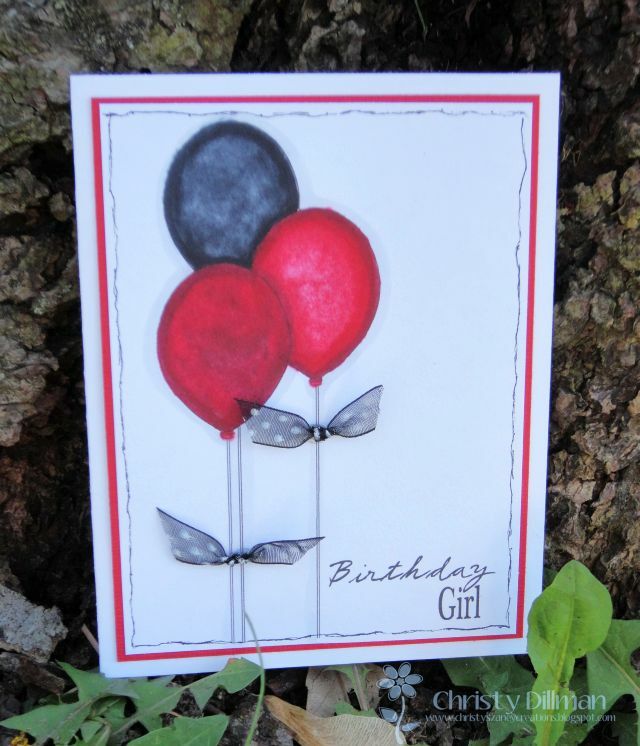 I chose to do something a little different and not work with the main clown image, but combine the balloon image along with the sentiment using Paint.net to create my fun and simple card! 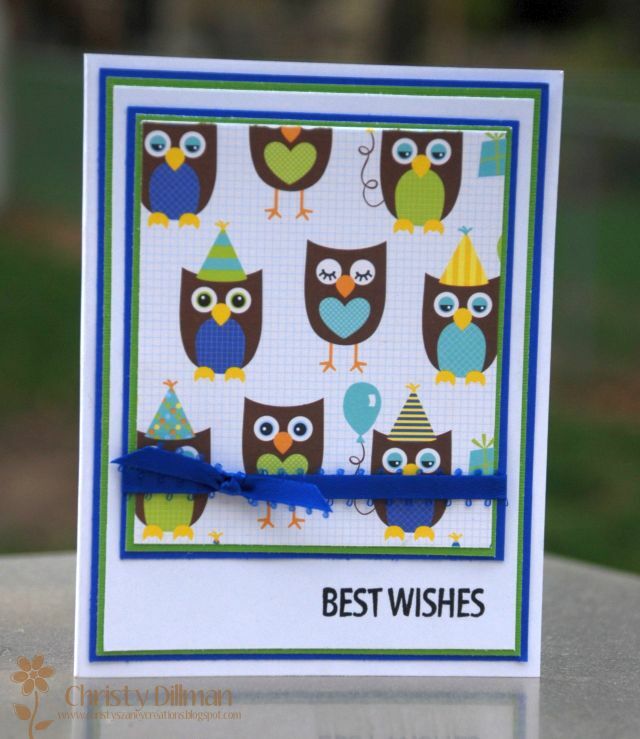 I added some fun scraps of polka dot ribbon and faux stitching to make my project complete! 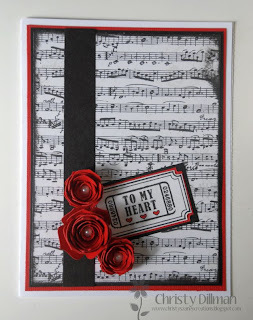 If you are looking for Craft Your Passion post, please scroll down to view! 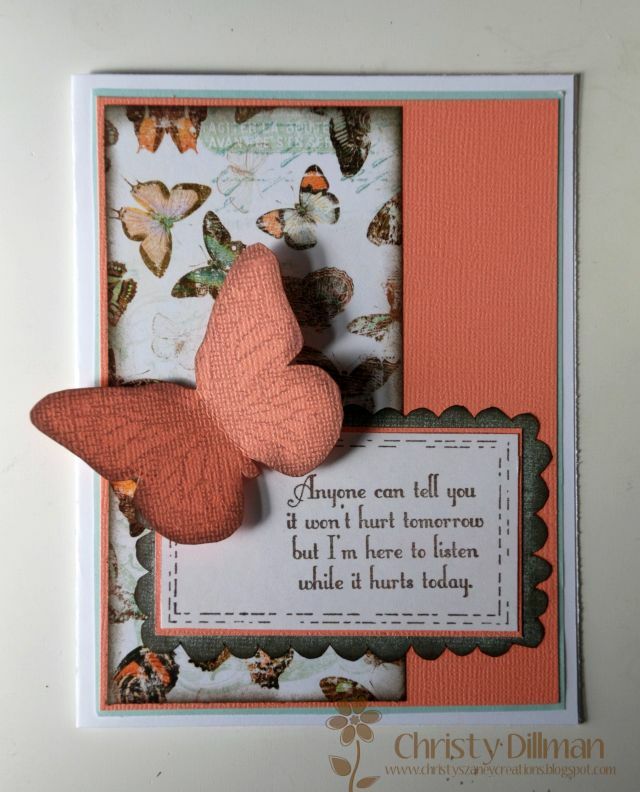 As March is winding down, that means it's time for our "Anything Goes" challenge at Lollipop Crafts. 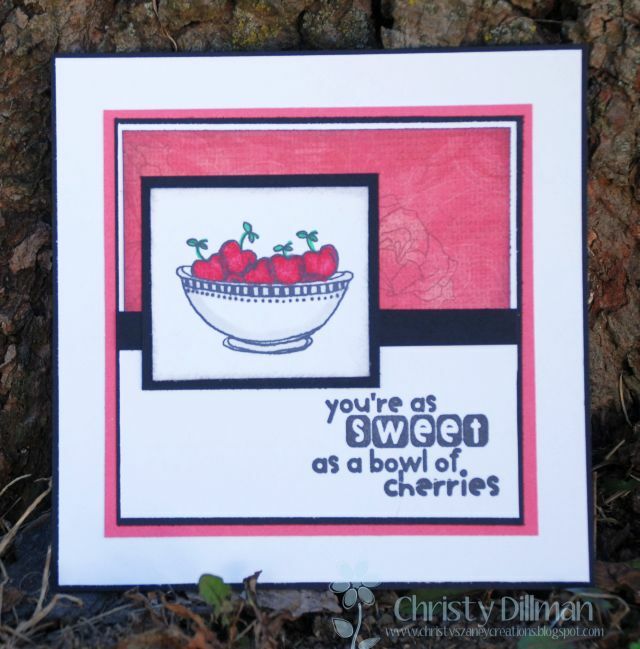 I grabbed some scraps and this super sweet set of images from Unity called "sweet as a bowl of cherries." 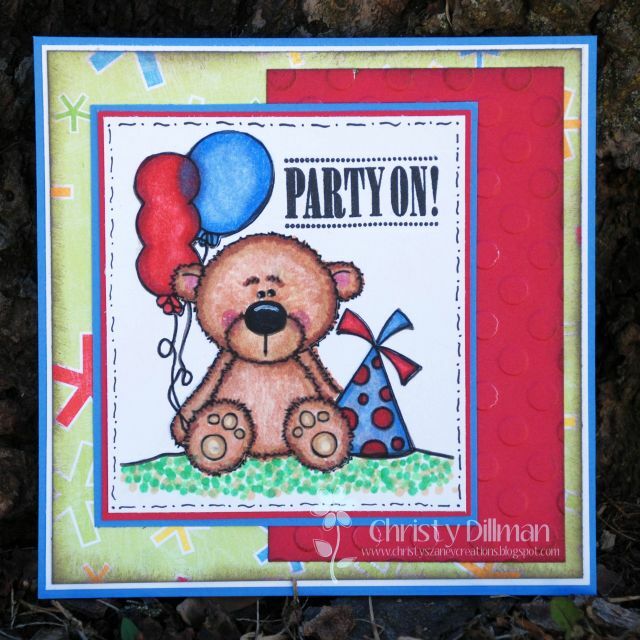 Once again I decided to go with a super simple design to let my images be the stars of my card. The Lollipop girls have joined together this week to showcase their "anything goes" projects, so make sure to head over to the LC blogs to see the girls in action! Delicious Doodles. 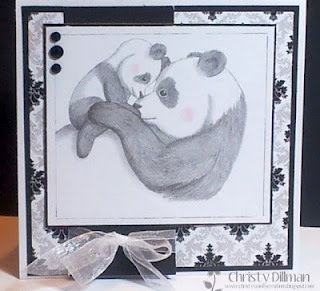 I feel in love with this "Panda Love"so black and white immediately was my color pallet! I decided to only add a small pop of color to the cheeks and left the rest of image alone to shine! Monochromatic is one of those things alot of people find difficult, but if you want to get some ideas then head over to CYP blog and see what our talented design team has come up with this week! Hope everyone had a beautiful weekend, I know we did as temps were in the high 70's and that means the start of another baseball season! This is an exciting time in our house as both of my boys are die-hards when it comes to baseball, I am not kidding dueing this time of year they literally eat, sleep, and breathe the game! We are so proud of Micah as he found out last week that he made the Varisty Baseball Team, one of only three sophomores- he worked so hard in the off season, even giving up basketball to foucs and prepare for baseball. I loved it when he told me some of the kids asked him "Why didn't you play basketball this year" and he repsonded "This is why, making the varisty squad was my goal." I do not think I have seen him with a bigger grin on his face, reminded me of when he was a little-oh what a moment! Well enough of that today brings a busy Monday full of lots of challenges that you need to check out! First up we have Craft Your Passion Challenges, where this week is all about the sentiment! That's right we want to see you focus on your sentiments, now I went with a simple design as I have been a little under the weather so my MOJO has left the building for a bit. 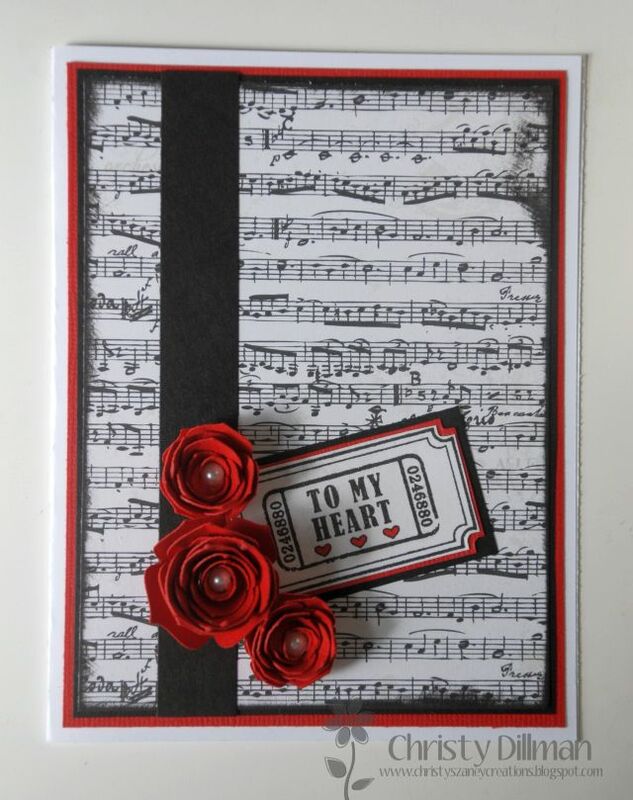 We are sponsored this week by Simon Says Stamps and one lucky winner will win a $20 gift certificate to their store! 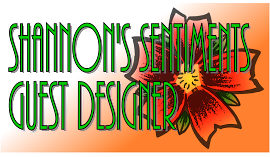 Now it's not often this happens, but the challenge this week at Lollipop Crafts is "Sentimentally Yours"- use your sentiment as your focus. How about that you can kill 2 birds with one stone and enter both of these challenges! 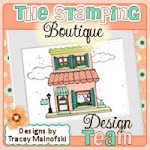 This week the sponsor is The Stamping Boutique and someone will win 3 digis of their choice from one of my fave stores! 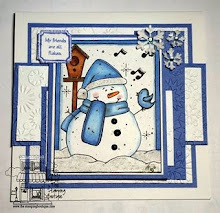 Both of my cards are done using stamps from Unity, I hope I have shown you a few different ways that you can make your sentiment the star of your cards! 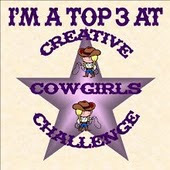 Come play along with us for your chancce to win some fabulous prizes and see what both DT's have created to inspires! 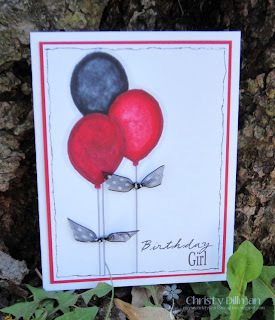 It's a Birthday Blog Hop for a Lollipop Girl! 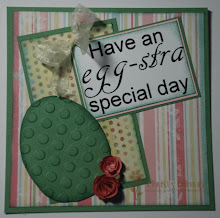 It's Krista Palakiko's birthday today and a few of us are throwing her a surprise birthday blog hop. 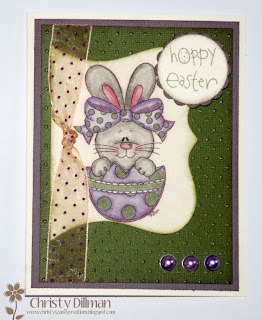 If you've come here from Cyndi's'blog then you are on the right path, but if you just popped in you might want to hop on over to the beginning at the Lollipop Crafts blog. Why? Well one lucky hopper will win a SURPRISE PRIZE! 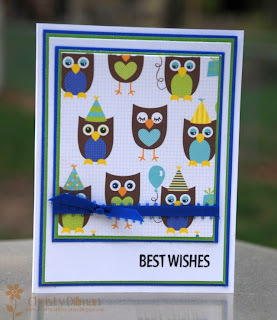 All you need to do is hop along to each friend’s blog, leave some love, then head back to the Lollipop Crafts blog and let them know you completed the hop. Who knows maybe along the way some of Kris' friends might be giving away RAKS of their own, so make sure you stop and give some love to everyone. The winner will be announced on Sunday, March 18th. Now head on over to Mimi's blog to see what beauty she has created for Kris.